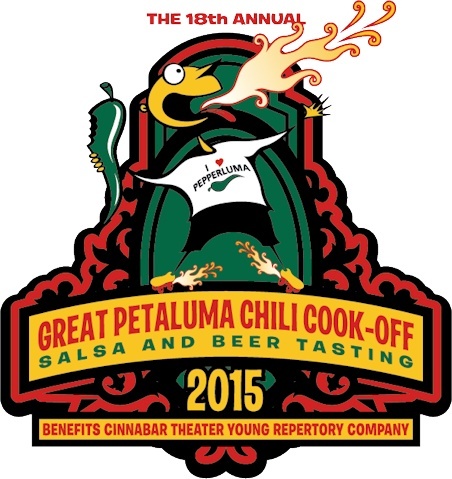 On Saturday May 9, 2015 over 1500 people will converge on Behrens Park, Herzog Hall at the Sonoma Marin Fairgrounds in Petaluma for the 18th annual Great Petaluma Cook-Off, Salsa and Beer Tasting event starts as usual at 1 pm.. Will you be there too? You will not only experience great food, beer, and entertainment, but you will also be supporting over 1200 kids in the Cinnabar Theater (a non-profit) Children’s Programs. Want to know how to double your donation? Ocean State Job Lot Foundation will match your donation made between now and May (a grant that they have been providing over the past 10 years each year raising the bar). Tickets are free for kids under 5, $10 for ages 5-11, $25 for adults, or $40 with beer. To purchase a ticket, or for more information, call 707-763-8920 or visit GreatChiliCookOff.com. You can also purchase your tickets at the gate on the day of the event. Entertainment expected this year at the popular Stony Point band with opening act from Don’t Tip The Tweetster (Ska Band) followed by Sister Sirens and Zyphire Belly Dancers, then the Hip Hop Dancers from the Fierce Dance Company. Also The Amazing Caine will be walking around dazzling guests with his illusions and magic. 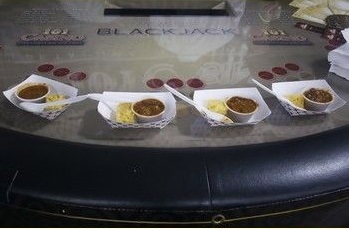 Annually 40 Chili Teams compete as well as 15 Salsa Teams and 15 Breweries (This year there are 16 breweries entered). The Cinnabar Theater is the non-profit regional theater supporting students in arts and entertainment whose organization’s primary means for funding is special events and ticket sales. SOLD OUT! The competition is so fierce all challenger spots are taken. There is a short waiting list and every year there is a team or two that drops out – so there is still hope – you can call the theater to get a spot on the waiting list. There is room for more vendors so if you want to get exposure for your business, contact Laura Sunday at (707) 763-8920 or email her at [email protected]. Also long time brewery supporters include Lagunitas, Moylans, Ruth McGowans, and Lost Coast. Author Wayne DunbarPosted on April 14, 2015 Categories Featured, NewsTags #CraftBeer, Petaluma, The Great Petaluma Chili Cookoff, When is Petalumas Chili Cookoff, When is the Great Petaluma Chili Cookoff?, Where is Petalumas Chili Competition?